Australian Dust Control designed and installed a Spray Booth Dust Collector for Weir Minerals at their Artarmon site in NSW. The existing Spray Booth Dust Collector they were using was out dated and inadequate for their needs. Australian Dust Control was commissioned by them to design a solution that would fully contain the shavings of polypropylene produced as a waste product in the manufacture of slurry pump liners for the mining industry. The Spray Booth Dust Collector they were currently using did not fully enclose the work area and therefore did not completely contain the polypropylene shavings resulting in discharge into the general factory area. 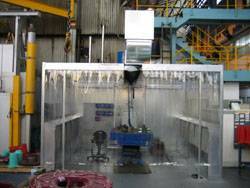 Australian Dust Control met the challenge by designing and installing a custom built, fully enclosed Spray Booth Dust Collector. The surface area of this Spray Booth Dust Collector is 4 m x 6.3 m and is 2.5 m high with an 11 kw fan positioned on top of the Spray Booth. Instead of the conventional galvanised sheet used in a Spray Booth Dust Collector, Australian Dust Control used panels of polycarbonate sheeting. This special feature that Australian Dust Control custom designed had the additional benefit of allowing natural light into the spray booth area and therefore eliminating the need for florescent lighting.